And then there were eight. With their dispatch of the Oakland Athletics yesterday eve, the New York Yankees earned their fourth match-up against the Boston Red Sox in postseason play, their first in the LDS. The Sox are favorites in that series, advancing to the ALCS 56% of the time according to my RPScore model and simulator. In the other ALDS contest, the Houston Astros are my heavy fave over the Cleveland Indians, winning the best-of-five series 62% of the time. But enough about the Junior Circuit: today marks the beginning of NLDS play, in which the top-seeded Milwaukee Brewers expected to beat the Colorado Rockies 58% of the time. That's a confident projection, but my system's even more confident in the Los Angeles Dodgers. RPScore rates LA best-of-breed at the moment, prompting the simulator to pick the Dodgers over the Atlanta Braves 64% of the time. 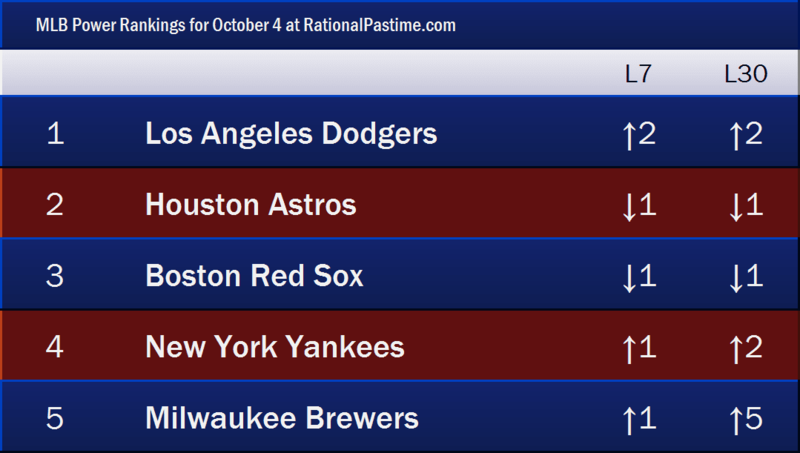 With Oakland's elimination, the Brewers move into the RPScore Top 5 for the first time all season. Milwaukee also rates as the most improved team over the past 30 days, not just among the five best but all thirty teams. The Dodgers remain both the best and the most unlucky, with a win percentage nearly a full standard deviation worse than their RPScore-estimated true record. Bettors, however, don't think the Dodgers are as unlucky as I do. This morning's World Series line at Pinnacle indicates that I'm overstating the Dodgers' talent relative to the rest of the league, paying out about 6:1 versus my 4:1 estimate. Part of my system's confidence in LA could be due to its lack of confidence in the Braves, whom I've underestimated all year. Of course, so did everyone else and, for what it's worth, the smart money isn't exactly pouring into Braves World Series futures. Indeed, a significant volume of that that cash flows to Denver (money has negative mass so it can flow uphill, which is also why inflation happens), where the Rockies enjoy the favor of touts more than that of my spreadsheets. In re: aforementioned estimates, I'm calculating a Dodgers win in four games as the modal outcome. 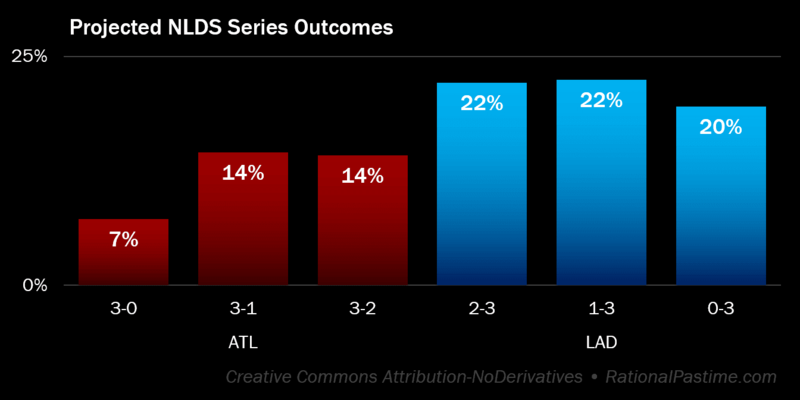 Every discrete pro-Dodgers outcome is more likely than any pro-Braves outcome, with LA at 4:1 to sweep. Atlanta's best bet is also a victory in four. The top-seeded Brew Crew is the favorite over their wild card competition, with the modal outcome a Milwaukee win in five games. 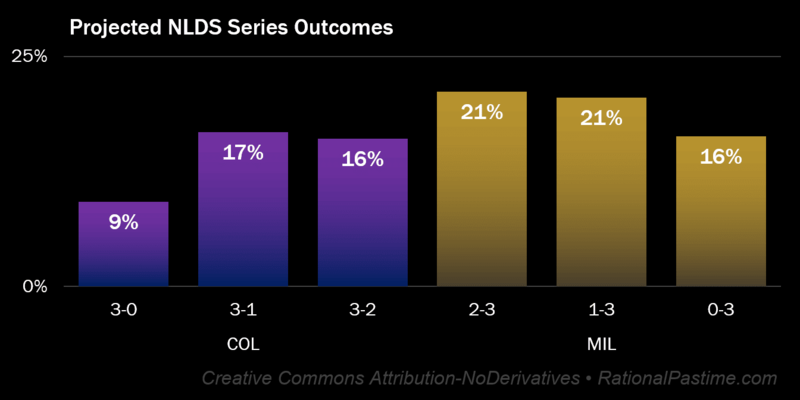 Colorado's best bet is a win in four. 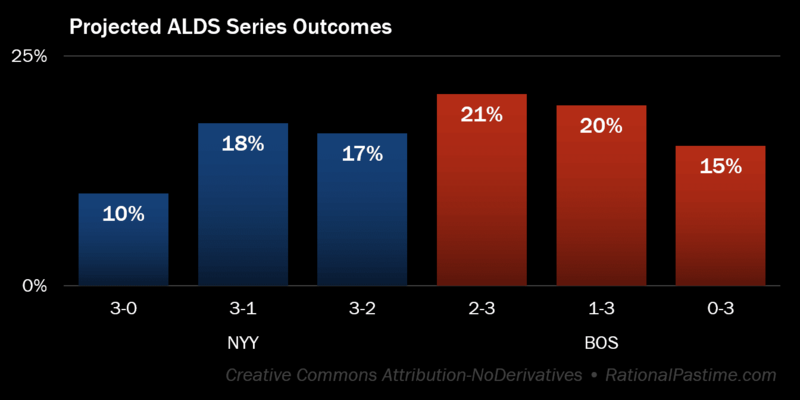 In what the networks will insist is the marquee match-up of this early postseason, the Red Sox are in a strong position over their eternal rivals, the modal outcome a win in five games. The Bronx Bombers' best bet is to win in four and prevent a return to Fenway Park. Despite winning their division, RPScore doesn't think much of Cleveland. That's why the Astros are favored to win this series in five. 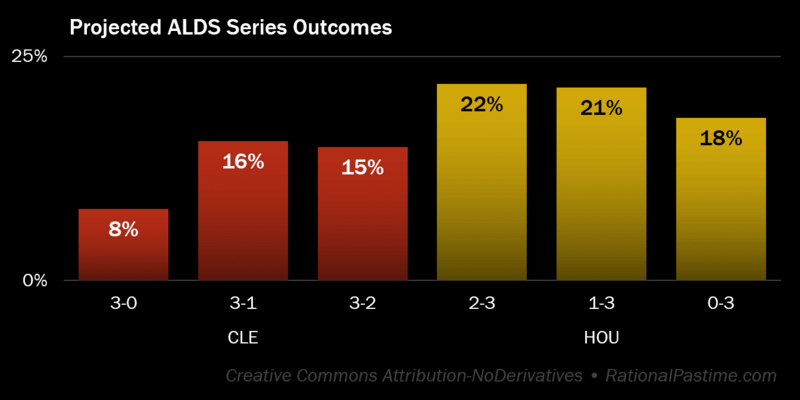 Each discrete outcome representing a Houston victory is more likely than a correspondingly victorious result for the Indians, with the Astros about 13:2 to sweep. As with the other underdogs, Cleveland's best bet is to finish the series off in four. To give you readers a deeper glance into my model, the table above displays the ten most likely discrete World Series outcomes at the start of the LDS round, in addition to the most likely victory scenarios for the teams outside the top ten. AL victories over the Dodgers in the 2018 Fall Classic are common results, followed by a Dodgers victory over the best AL teams. The Yankees debut on this list at 17 with a seven game victory over LA, with the Brewers, Indians, Braves and Rockies popping up at 22nd, 57th, 66th and 69th respectively. As we move deeper into the 2018 MLB Postseason, I probably won't be posting every day. However, I'll be posting updated numbers daily on Twitter @RationalPastime and posting anew following eliminations and at the start of each series. Crack on, baseball fans!